I consider myself racially ambiguous—my mother is Colombian and my father is German. Living in a small town, my mother and I were the only people who had darker skin. As a result of this, assimilating by observing how the town behaved seemed most important. The thought was, “We don’t talk about it, whether that be mental health, race, etc., because we are stronger than that. Strong people do not show emotion—sadness, anger or affectedness in general—in the face of adversity.” The initial impact for me was that I began to experience anger, low self-esteem and confusion. I even started distrusting my own emotions. Eventually, I turned to negative coping skills to “be like everyone else.” When I was diagnosed with depression at a young age, I attempted to ignore and deny, on repeat. To me, recovery means validating my own feelings, trusting in my experiences and admitting that it was not my fault. I feel that it’s very important to show students, parents and educators that mental health conditions happen regardless of race, culture, gender, or status. 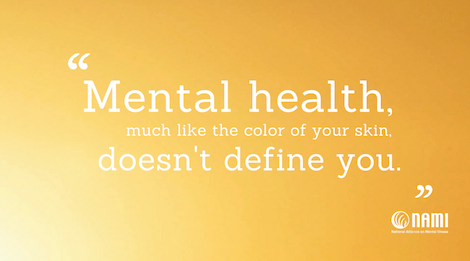 And because of this, your mental health, much like the color of your skin, doesn’t define you. I think the most important thing that I can offer during a NAMI Ending the Silence (ETS) presentation is that I represent “someone you’d never expect to struggle” upon first glance. Representation helps humanize the experience of those who have lived with mental health conditions. I want others to see me as successful and as someone who just so happens to live with a mental health condition. Hannah is a NAMI Ending the Silence presenter with NAMI Dallas, which serves four large urban and suburban counties that are home to hundreds of thousands of families from a wide variety of cultural and ethnic backgrounds. Hannah’s story is the second installment of a three-part series during National Minority Mental Health Awareness Month.